LONDON, England -- The England football team has long been seen as one of the best supported squads in the world. Fears: The threat from terrorism, which Ukrainian security forces have been training to prevent, and concern racist hooligans might target England fans all look to put supporters off. But it now faces the prospect of being deserted by fans ahead of this summer’s European Championship in Ukraine amid safety concerns and general apathy. Mounting fears that local racist hooligans may use the major event to target fans from ethnic minorities and a spate of terrorist attacks are thought to have added to factors putting off supporters. Of the 9,000 official supporters tickets made available through the Football Association, just 2,000 have been sold for England's opening game against France on June 11 at the Donbass Arena, in the former mining city of Donetsk. And only 1,000 more tickets have been sold for the game against hosts Ukraine in the country's capital Kiev on June 15. The dismal figures will be the lowest turnout ever for the Euro competition. Assistant chief constable Andy Holt, who is leading the British police involvement in the tournament, warned that England supporters could be goaded by local racist thugs. He said there was little intelligence that England fans were planning on causing trouble, adding: ‘The reality is that the overwhelming majority of England fans heading to Euro 2012 are there to support the national team and the game of football. ‘Those who engage in any trouble must realise that they will feel the full force of local policing laws. 'Anyone involved in football-related trouble can also expect to face a football banning order when they return to the UK." England's recent run of poor performances in international tournaments also looks to have dented support. The FA says it has been liaising with fans and authorities over safety concerns and believes many more supporters will be getting tickets directly from UEFA. A record 70,000 fans headed to Germany to support England during the 2006 World Cup. But confidence in safety at this tournament has been hit by a series of devastating terrorists attacks. 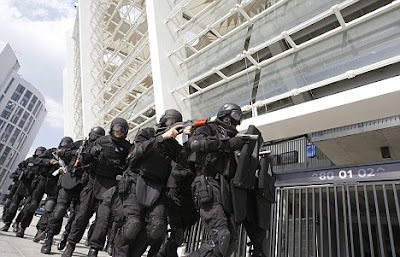 UEFA have played down the threat of trouble and tried to reassure fans that security measures for Euro 2012 are adequate despite a series of explosions in the Ukrainian city of Dnipropetrovsk. Dnipropetrovsk was initially set to be a host city for Euro 2012 but was replaced in 2009 by Kharkiv. It is located around 240 miles from Kiev, the destination of the tournament final.